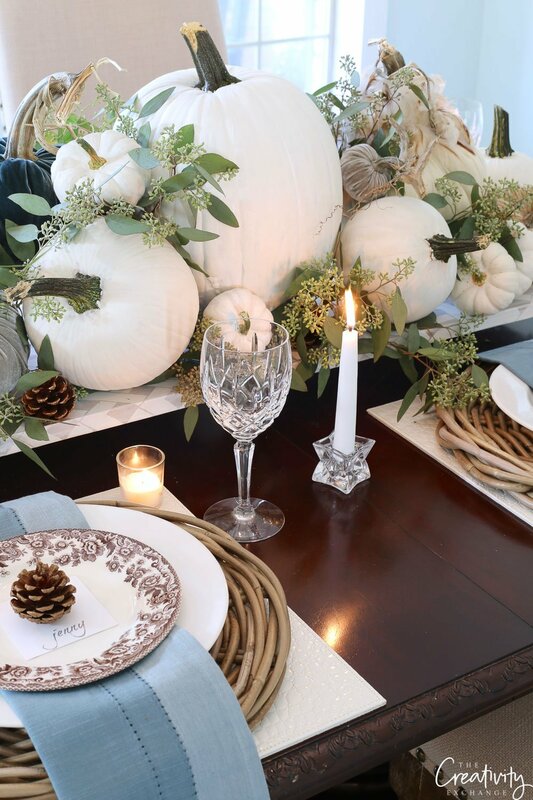 As we head into fall and the holidays, I have been wanting to do a Moody Monday post sharing a few of my favorite fall tabletop decor ideas and staple pieces for entertaining that carry me through all of the holidays. 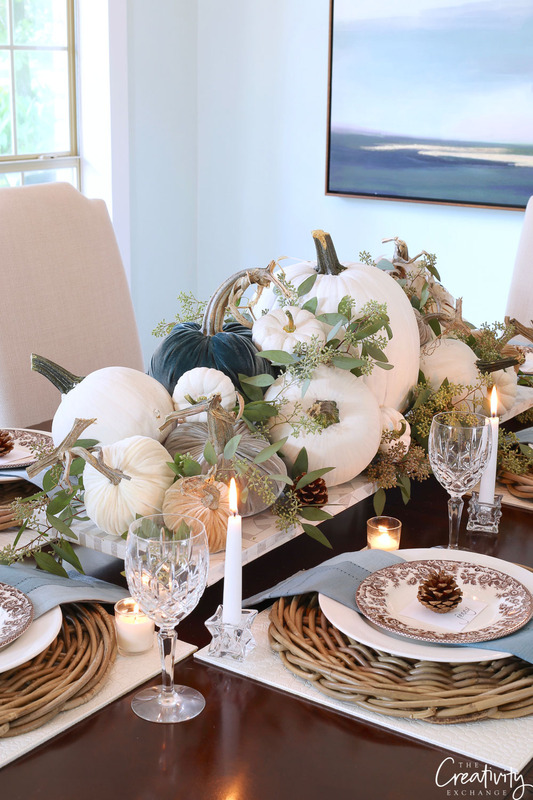 I also wanted to share just a few easy tabletop decorating tricks for the holidays and entertaining that are so easy and make for an instant pretty table! 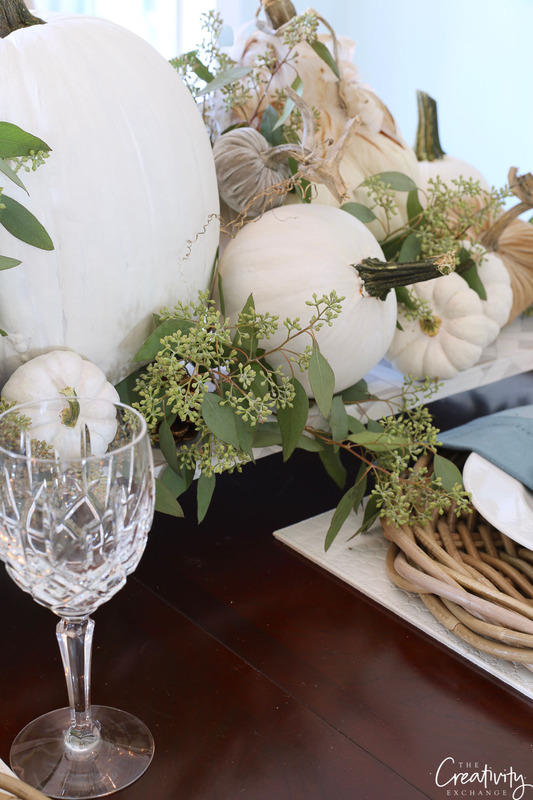 I recently had a fall dinner with friends at my home and I took some pictures ahead of time to share with you for today’s post. 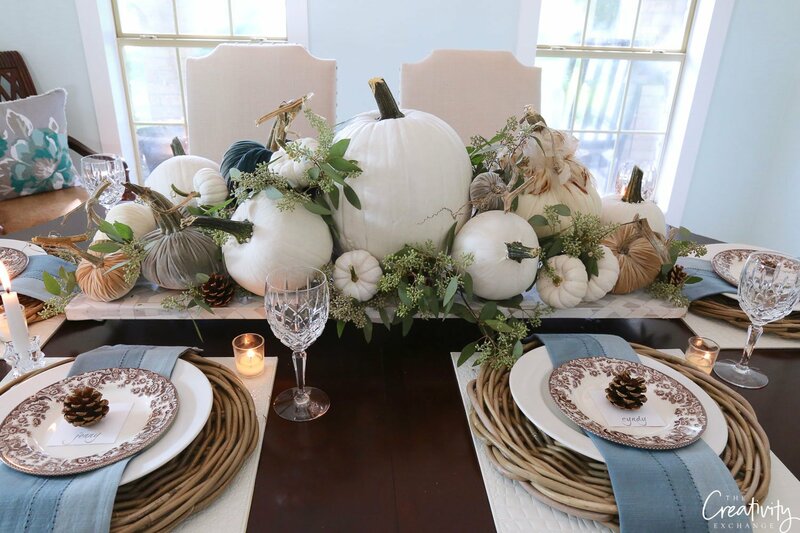 One of my favorite ways to create a beautiful centerpiece in the middle of a table is using a simple long piece of plywood (that I found in my garage) that I covered with wallpaper! So easy and I shared a tutorial for here. 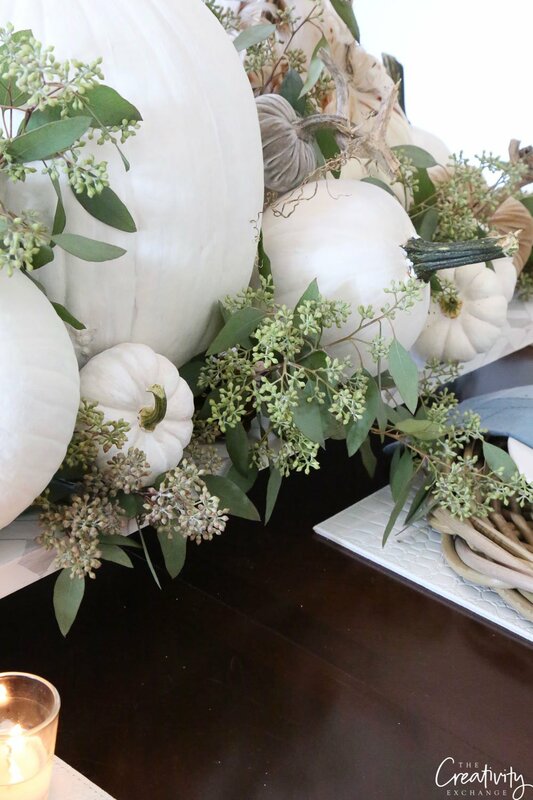 I use this for almost every holiday in the center of my table! 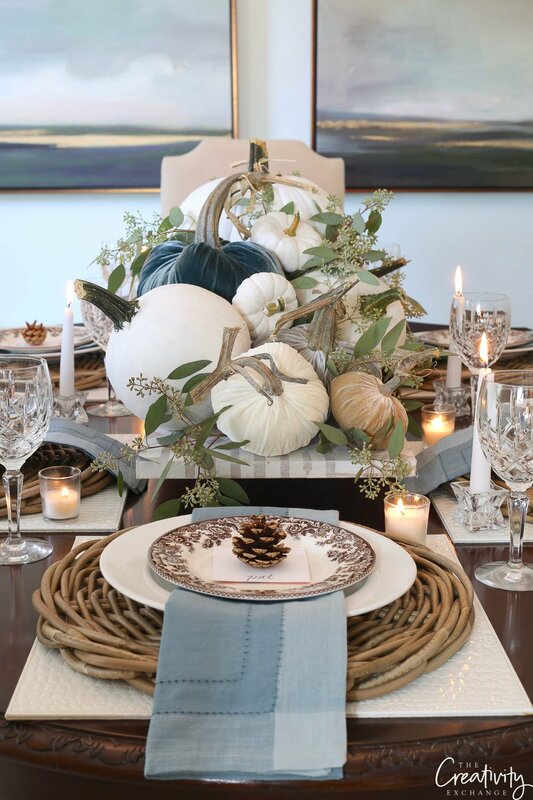 For my fall table, I elevated the tray with two bowls that cannot be seen under my oversized tray. 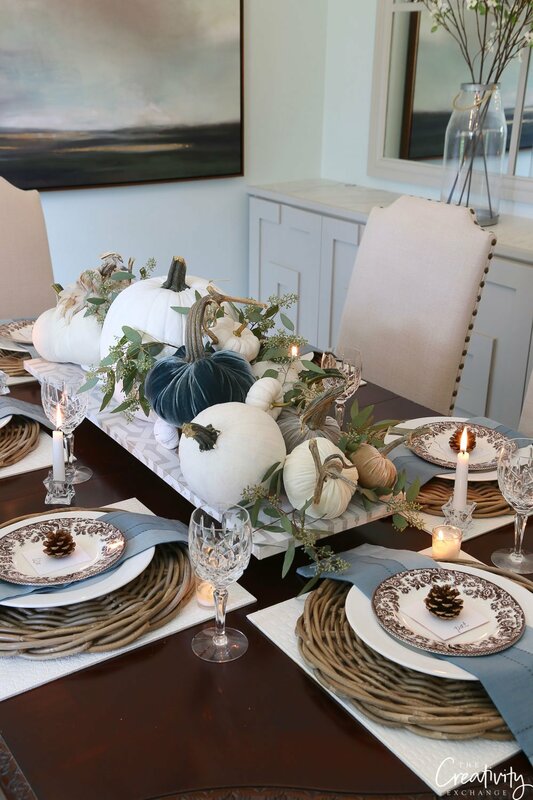 Whether fall, Christmas or even other holidays like Easter, this extra long tray makes it so easy to layer in seasonal decor, fresh greenery and candles for an instant beautiful centerpiece! 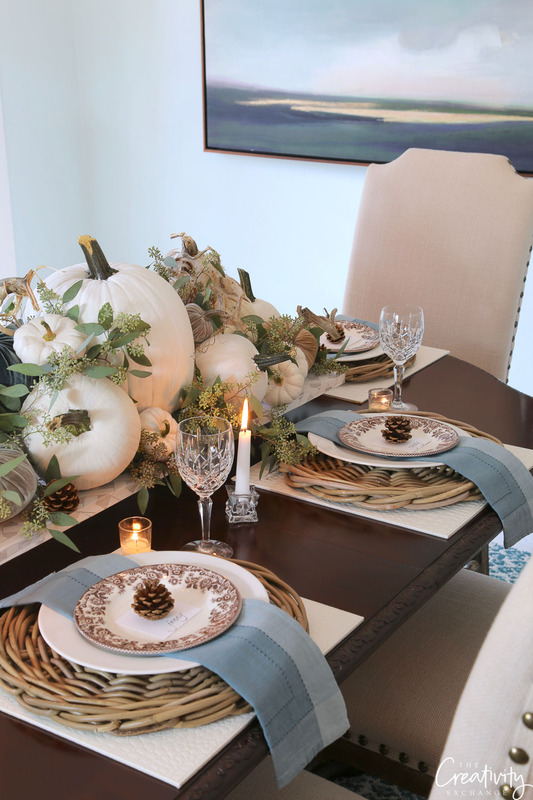 Elevating it with bowls makes the centerpiece stand out even more. 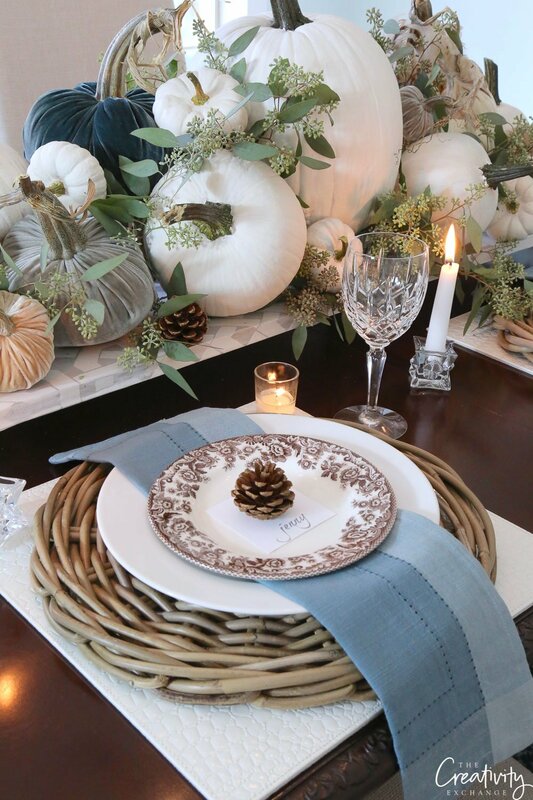 For my fall table, I just layered white pumpkins, fresh eucalyptus, velvet pumpkins and pinecones. 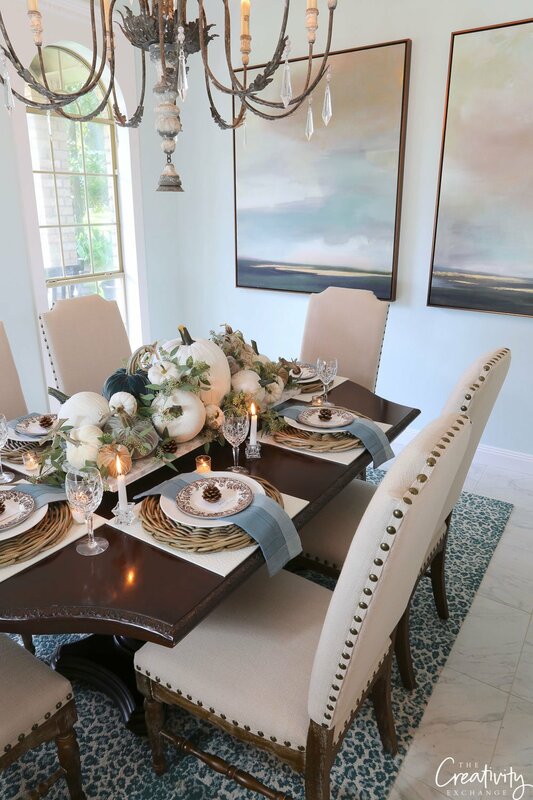 No matter what holiday or season it is, incorporating fresh greenery like seeded eucalyptus into a table is an easy way to create a fresh and beautiful table. By the way, seeded eucalyptus dries beautifully (the regular eucalyptus is not as pretty dry). If you don’t know where to find seeded eucalyptus where you live, you can usually find some at your local florist, which is where I get mine. My local florist always has it on hand and sells me bunches at a great price because they buy so much of it as filler. 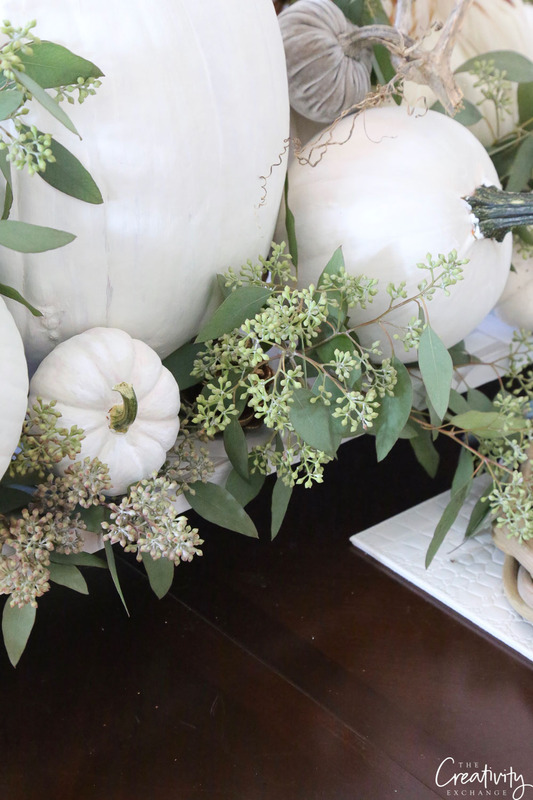 Just look at how pretty the eucalyptus is mixed in with the pumpkins. 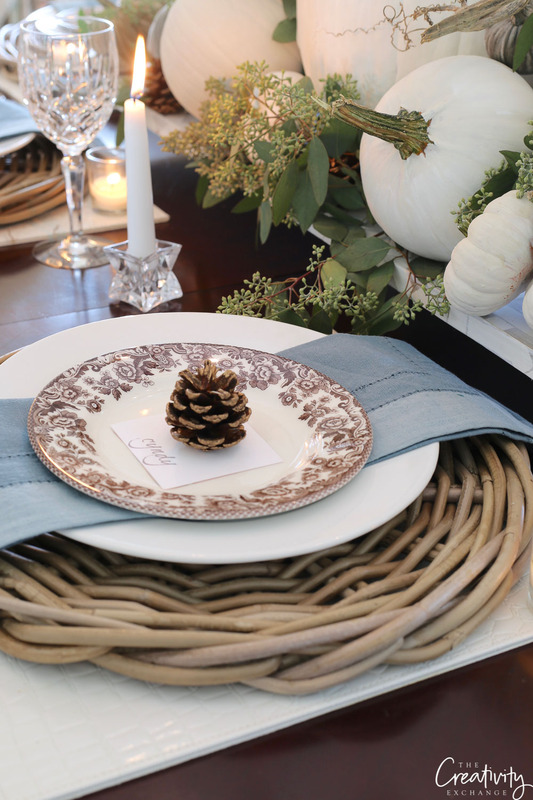 For place settings, I mainly use my Spode Delamere dishes because it works for all seasons and holidays. 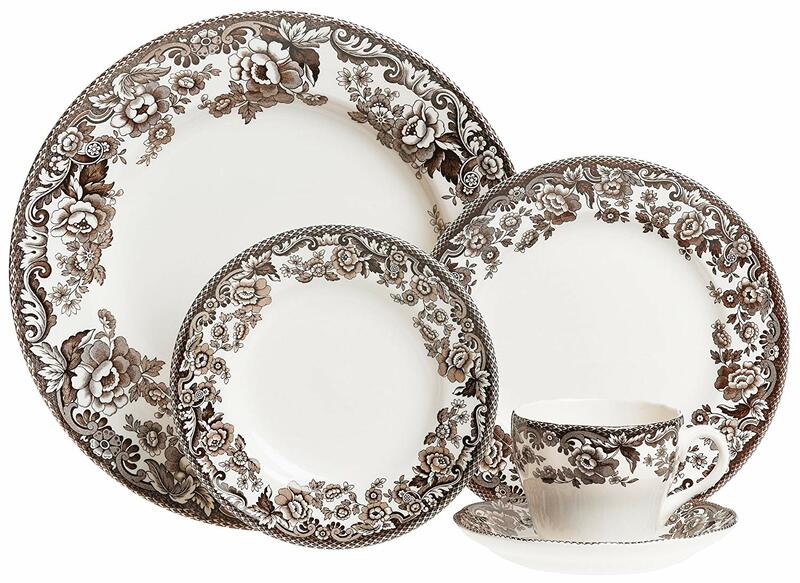 I LOVE these dishes because they are so pretty and elegant and the best part is they are dishwasher safe! 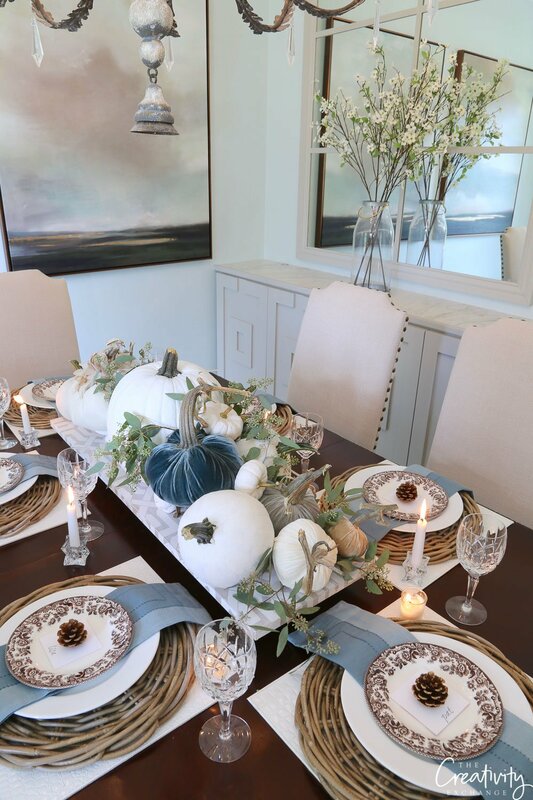 Sometimes I use the whole set together as a places setting or use the large plate with a different salad plate at Christmas or other holidays. 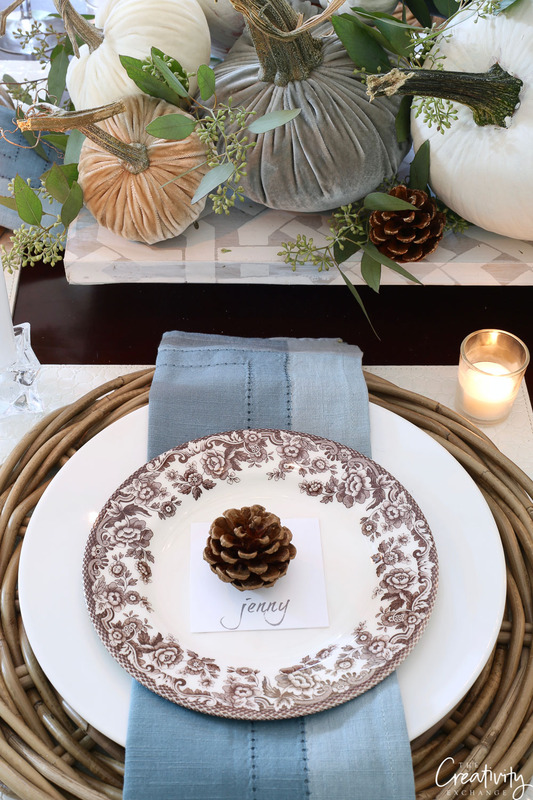 For my fall table, I used the Delamere salad plate with basic white large plates. 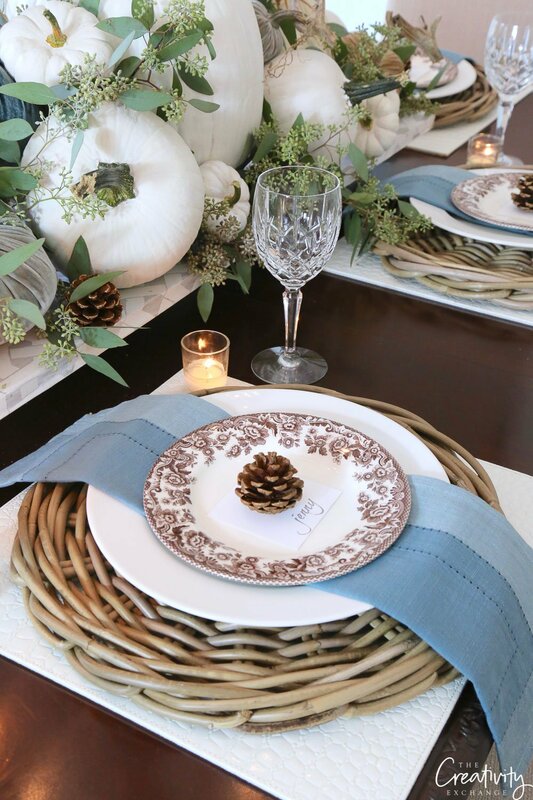 For this table, I used my white faux croc square placemats mixed with rattan chargers. The rattan just makes my table pop agains the white placemats. 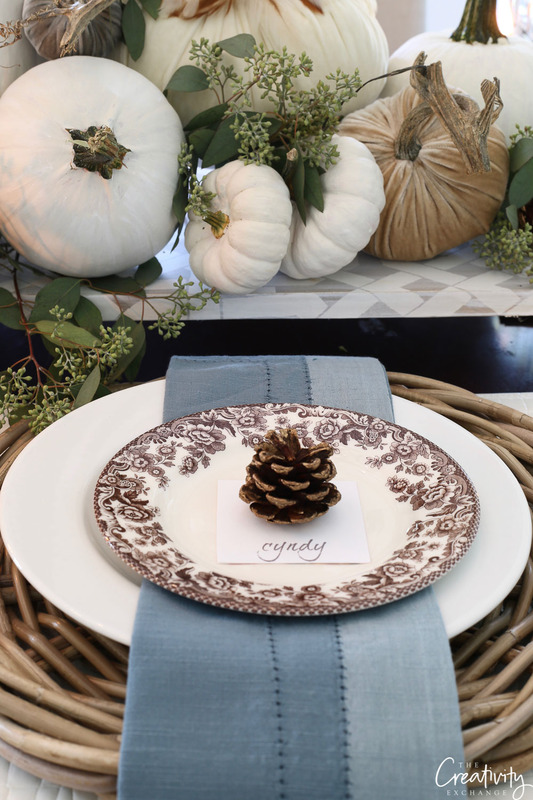 I do this place setting a lot for different seasons and just switch out the napkin colors for whatever I’m doing for my centerpiece. 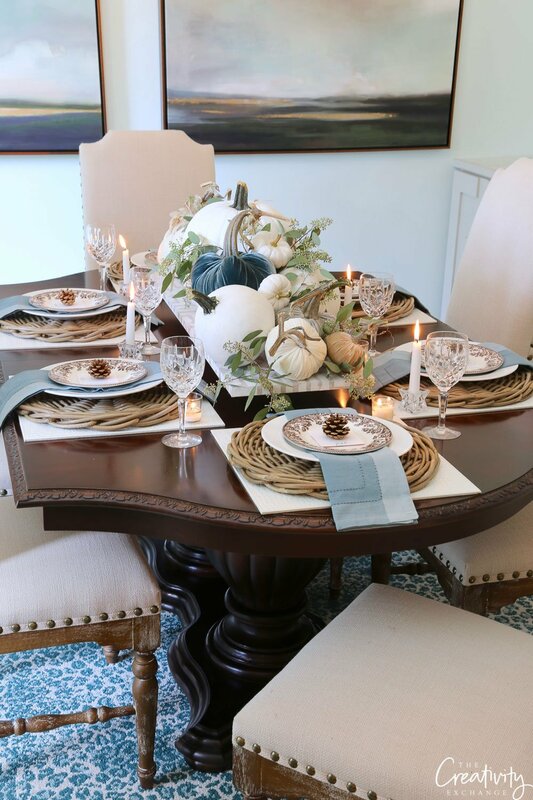 The great thing about these staple pieces that I use for my table is that at Thanksgiving, Christmas and Easter, with just a few changes like switching out napkin colors and decor in my centerpiece, my table is easy to pull together and ready for any holiday! 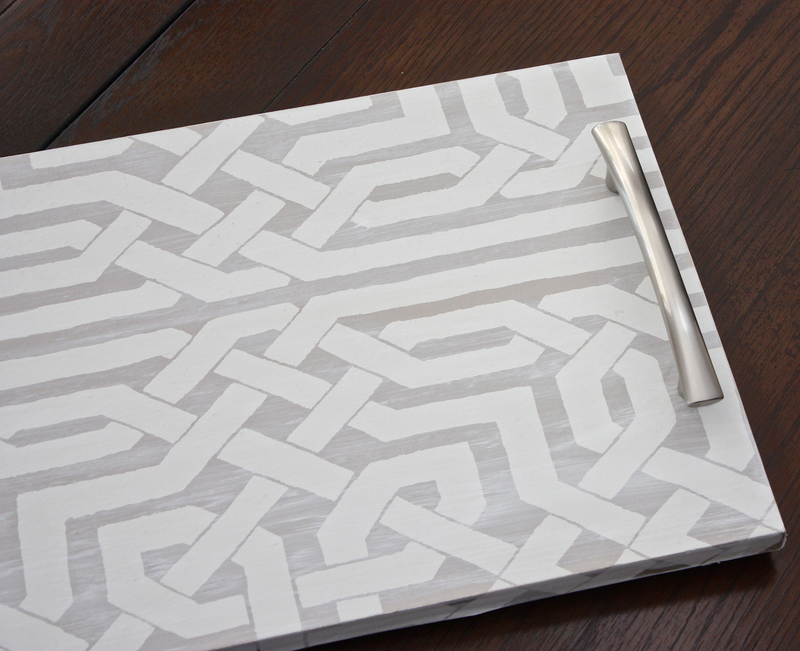 I also linked on today’s mood board several of my favorite staple entertaining pieces that maximize space. 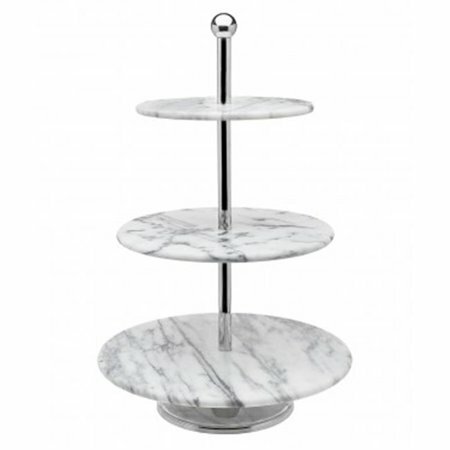 I use this three-tiered marble stand on my buffet all the time! It’s great since it’s marble, you can put things like cheeses, fruit, etc.. directly on the marble and it holds so much! 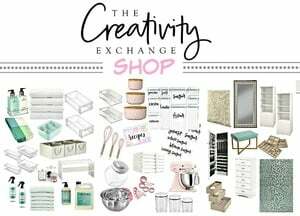 I use it for everything including desserts, appetizers and fruit. It maximized space on my buffet because it’s narrow and tall. 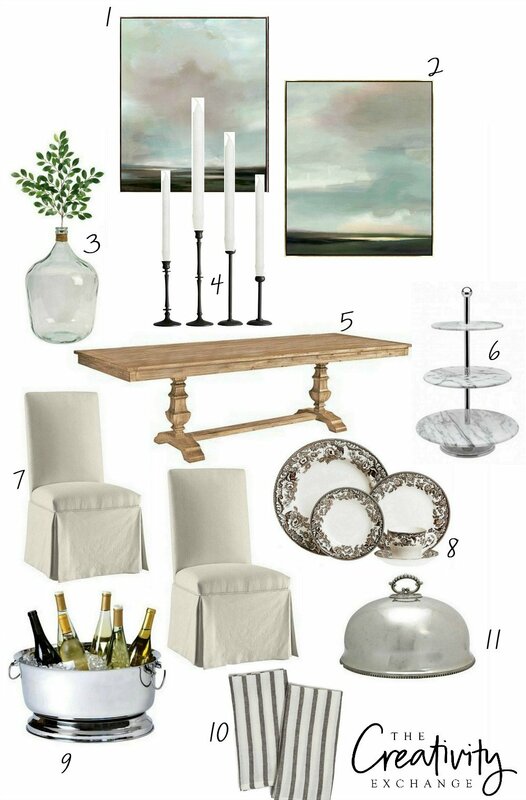 The rest of my favorite entertaining staple pieces are listed/linked above on today’s mood board. 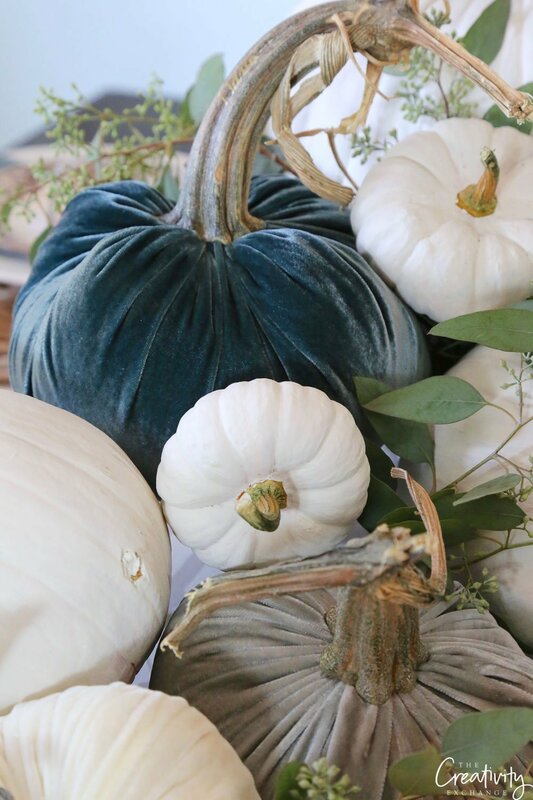 Also, if you want to find out more about my velvet pumpkins, where to order and other ways to use them, I shared a post here highlighting them. 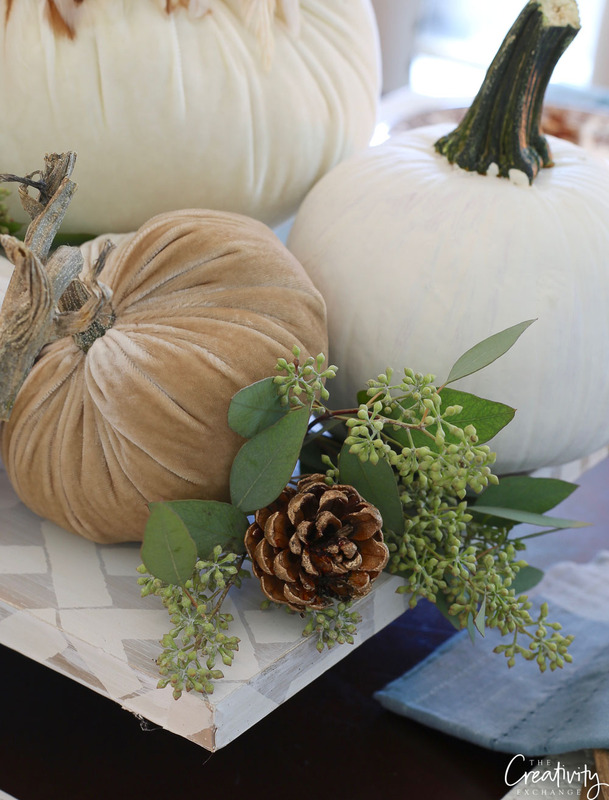 There are so many creative ways to decorate a table seasonally but if you’re crazy busy like me, using staple pieces like this that work for all seasons and holidays makes things so much easier! 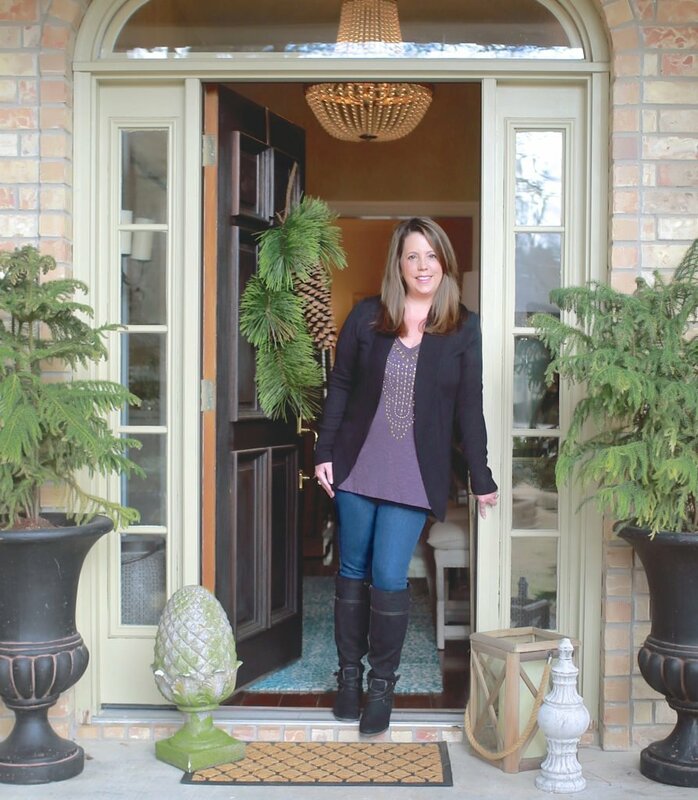 Once again – inspirational! Now I’ll get out of my lackadaisical mood and get on with it – thanks to you!! My “fall table” consists of some old (but attractive) potpourri in a crystal pedestal bowl, 2 starchy ghosts my sons made over 30 years ago and a giant rubber spider. It looks kinda cute! Don’t overthink it is my motto these days! 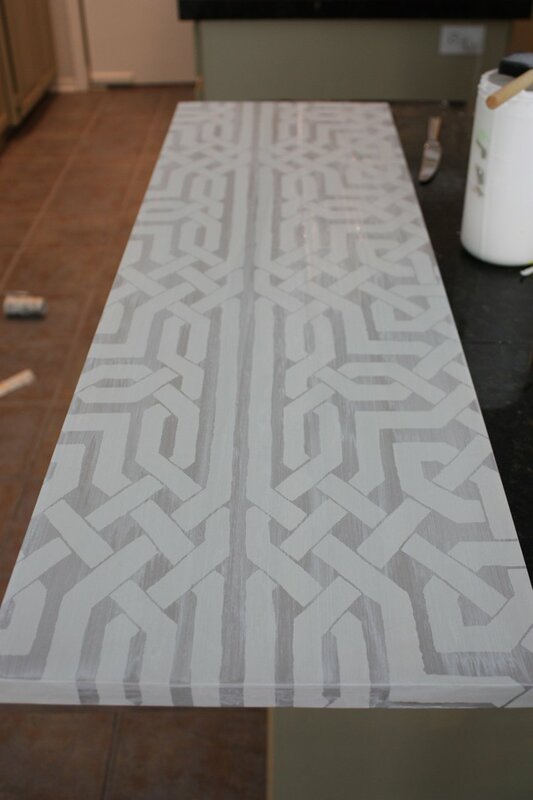 Benjamin Moore’s 2019 color of the yr .
Wasn’t expecting a cool gray color . Beautiful tables ape and so inviting. 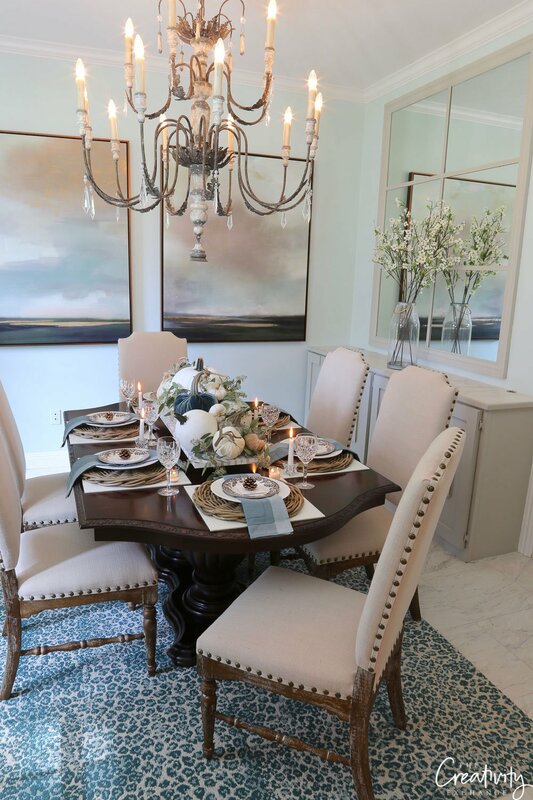 Love the use of soft, warm colors. What time is dinner?